generates new ideas, improves understanding, strengthens growth. ...Responsible citizens are aware, informed and involved! Thank you goes out to Cathy Clarke and Robert T Bell for coming in the cold and sleet to speak with Mark McAllister from Global TV about the historic, architectural and cultural significance of this beautiful building destroyed by Minto Friday Dec 20th, 2013 - Note the demolition by Minto was willfully done at the start of Christmas holidays and would not have been recorded except for Rosemary McConkey noticing the bulldozer and calling the media. Hats off to Mark McAllister making the drive to Oshawa. Rosemary's note to Mayor John Henry and Councillor John Aker: "With your underwhelming performance and fake sincerity that you care, this loss is yours!" "This is a story of Oshawa Mayor John Henry, Councillor John Aker and Minto pretending to show interest while thwarting all efforts to do something better. 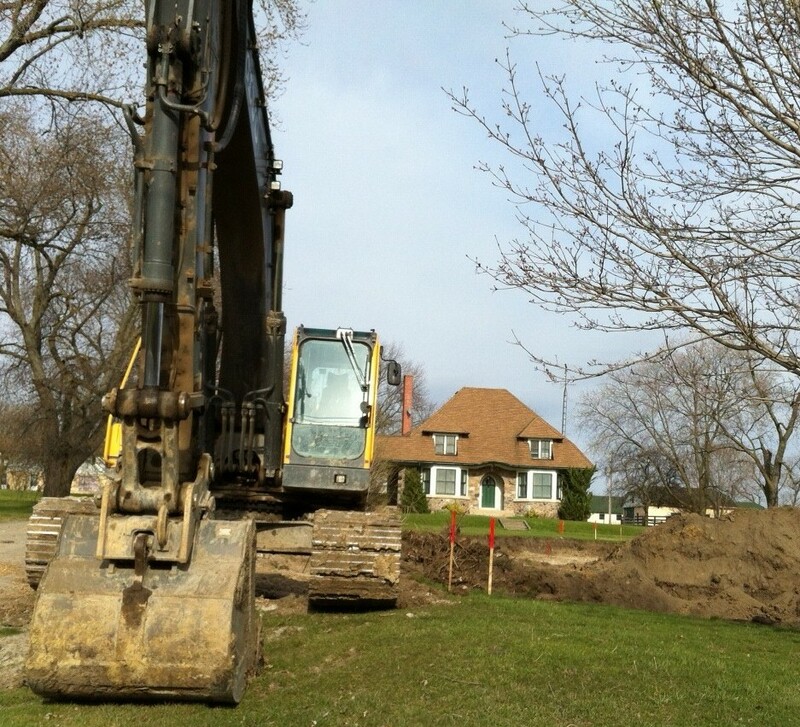 Originally the City was supposed to move the house next door to the city owned 2 acres for a future fire station. When Rosemary McConkey discovered in late March 2012 that the city had ditched its plan to move it 200 feet onto the vacant adjacent city lot and that Minto had requested and received demolition permission BEFORE the March public meeting for their subdivision, citizens rallied, made delegations to the City and put together two proposals to Minto/the Region and the City in April and May. 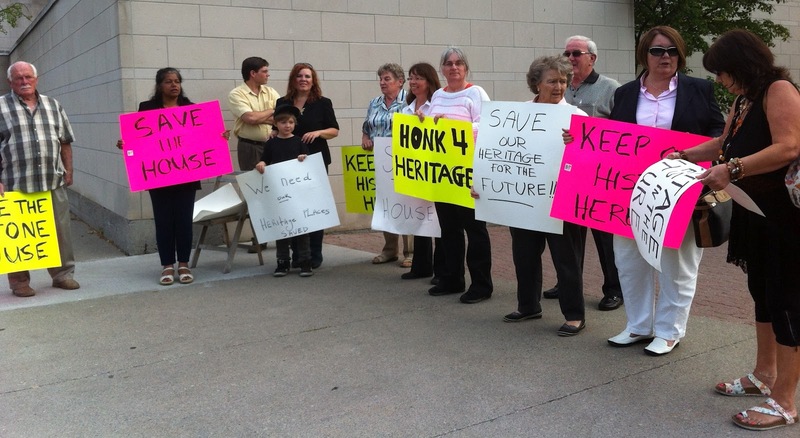 The grassroots group steering committee members were behind a revised recommendation from the city's municipal advisory committee, Heritage Oshawa, that the City and developer to consider alternatives to the demolition permit. They went before Council and the motion was approved 6 to 5. However when the motion went back to the City's Development Services Standing committee it was tabled, three times! The citizens were left without backup from the city. In June the grassroots steering committee members met with Minto executives in Toronto and were invited back for further deliberations. 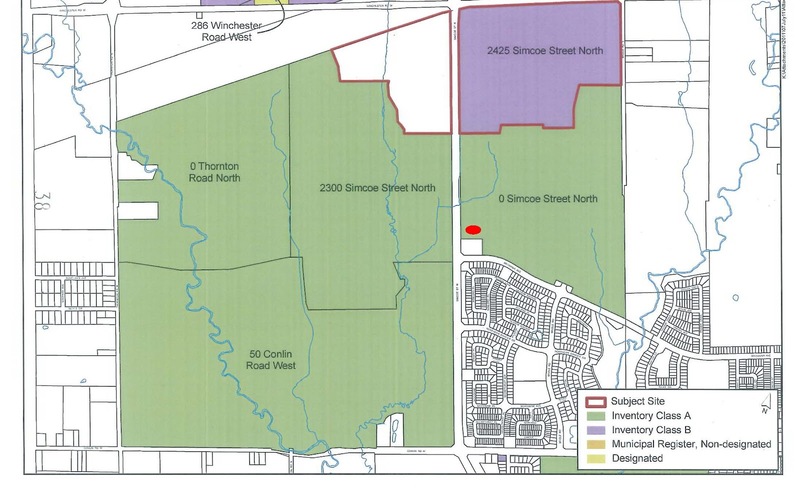 However when their July 6th scheduled meeting was pre-empted with Minto's Land Development Manager Tom Giancos rushing to meet with Mayor Henry instead, it became apparent the community consultation process was a pretense. Undaunted citizens continued to find a solution that would save the stone house. Two written offers in August and September from private citizens were submitted to Minto, but the developer and the City in their rush to have the sales office open in the fall, did not want to take any responsibility for any changes that might cause delay. 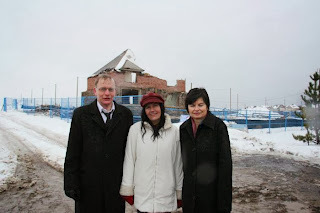 Then days before Minto planned to demolish the house in September 2012 the Ministry of National Resources kyboshed the plan. The habitat of the chimney swift bird in the stone house chimney needed to be protected and slowed Minto's rush to tear the house down. Historic Home Gets a Swift but Brief Reprieve (Toronto Star) For Mayor Henry to blame Heritage Oshawa for signing off is a distraction but typical of his habit of blaming others for his inaction. Heritage Oshawa is a lapdog of the city, it is empowered only when city staff and councils give it signals to do anything." 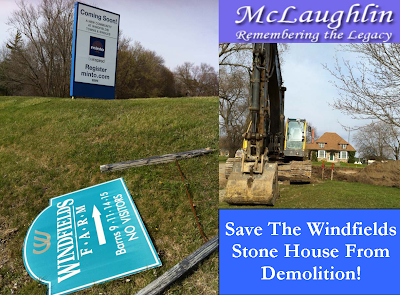 "This Windfields/McLaughlin stone house was a landmark that should not and need not have been destroyed. The excuses Mayor Henry uses don't wash for those who know what actually transpired from the time Minto bought the 150 acres on Simcoe St three years ago. Mayor Henry can pretend there was nothing he could have done but this unnecessary demolition is a testament to his weak leadership. His usual scripted messages blaming others and the fantasy of his all-is-great-in-Oshawa cheerleader speak may fool some but the fact is he allowed the City to be bought off with $150,000 which the developer offered four days before the city approved the Minto plan of subdivision." More from Rosemary's social media page: "I am an ardent property rights advocate. However, the operative word in with any development plan is 'approval'. Of course Minto had no obligation to preserve this building, but if John Henry and John Aker had given any signals of the City's desire to do more there certainly was an opportunity to do something. After the community made presentations and rallied to inform Council of the historical, architectural and cultural significance of this beautiful stone, former Windfields/McLaughlin Foreman's Residence, at the last minute, Oshawa Development Services staff put forward a report that Minto would retain the building, July 5th, 2012. But incredibly the next day Friday July 6 Minto rep Tom Giancos came to Oshawa (after cancelling our citizens meeting with him in Toronto) and met with the Mayor. 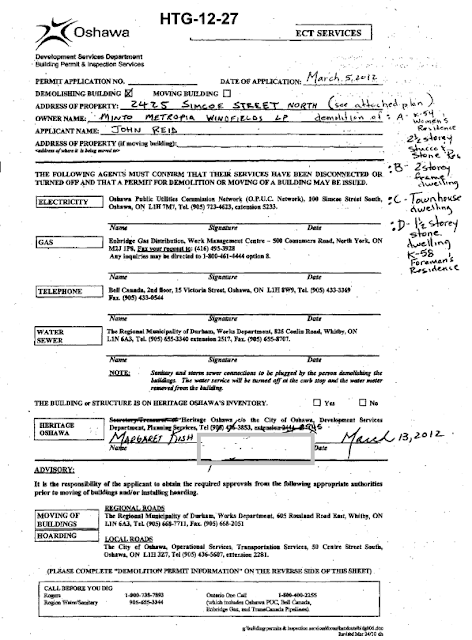 At that meeting Henry agreed to accept $150,000 and gave his blessing to the allow the demolition. 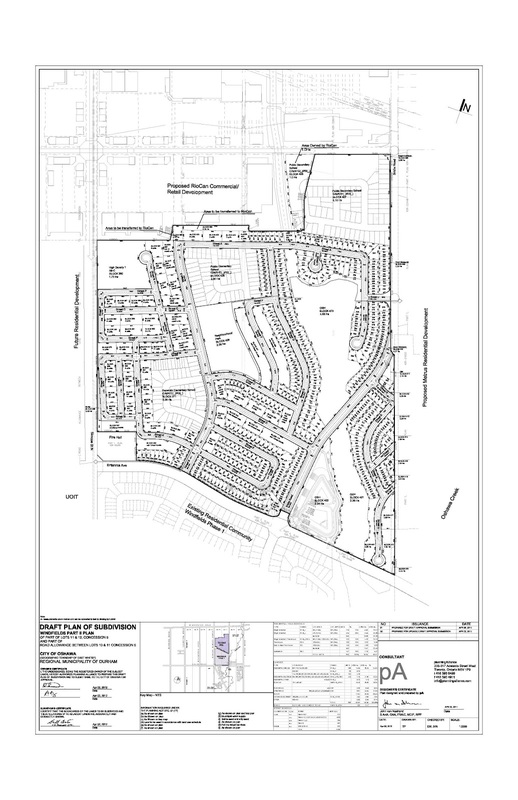 Monday July 9th this was put before the Development Services Committee for 'approval' and Thursday July 12th at a Special Meeting of Council the Minto plan of subdivision was 'approved'." A quote from Cathy Clarke: " It was a miserable day watching a miserable and needless demolition. Too bad Minto doesn't care about the community it's building in. And especially too bad that the Mayor and Council didn't do anything to prevent this travesty." Update: This is a good question for people to ask when visiting the Minto Kingmeadow subdivision. 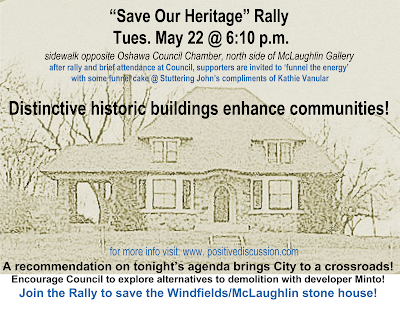 Or better still, why not implore the Builder to do more to help save the George McLaughlin stone house! Minto opened its Kingmeadow subdivision sales office in front of this heritage stone house Oct 27, 2012. 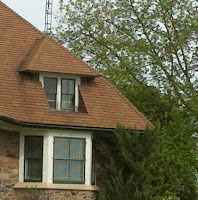 Minto planned to have the stone house smashed down before the opening, but the Ministry of Natural Resources gave the house a reprieve on account of the chimney swift bird. For story, check out this link to recent Toronto Star article: "History gets a swift reprieve"
Help rescue the Windfields Stone House from Demolition, before it's too late!! 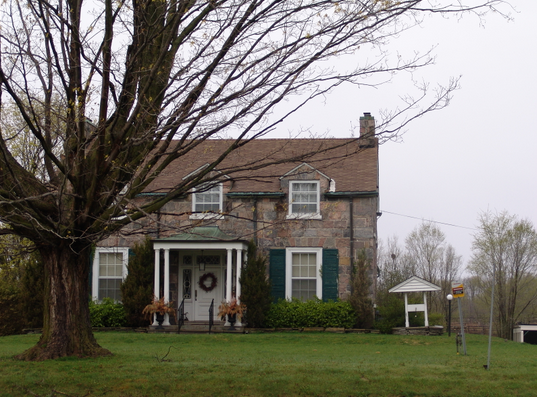 The former Windfields Farm 'Foreman's residence' one and-a-half storey stone house on Simcoe St. North is a historic Oshawa landmark that should not be torn down! 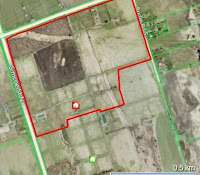 This distinctive and well-maintained heritage house is situated on Lot 12, Con 5, former East Whitby Township, on agricultural land that was under the continuous, consecutive control and ownership of two of Oshawa's most legendary families, the McLaughlins and Taylors, between 1917 until 2008.
aerial map of 'mirrored' west and east stone houses (2009) before trees cut and the Minto Group constructed a sales office in May 2012 in front of and obscuring the one and a-half-storey stone cottage from view on the east side of Simcoe St. N.
In 1916 George W. McLaughlin, older brother of R.S. (Sam) McLauglin, and First Vice President of General Motors of Canada purchased all of Lot 12 for his Elmcroft Farm. Under son Ray, and grandson George R. McLaughlin by the 1950s the farm had expanded to 400+ acres and included parts of Lot 11 to the east and 13, 14 to the west.. In 1927 across Simcoe St. on the west side George's brother Colonel Sam McLaughlin purchased parts of Lot 13. He also began consolidating land and his Parkwood Stables expanded west to include Lots 14 and Lot 15. In 1950 Edward Plunkett (E.P.) Taylor purchased Parkwood Stables which became the National Stud Farm. In 1956 the National Stud farm expanded across Simcoe St. to the east side and purchased Elmcroft Farm in assembling land for Taylor's growing Windfields Farm operations. Windfields was an internationally acclaimed horse farm and birthplace of Canada's finest thoroughbed 'Northern Dancer' until it ceased operations in 2009. The 'dot' on the map over the Mason name represents the 2 storey heritage house immediately to the north of (approx 300 ' from) the Craftsman-style one and-a-half storey stone 'Foreman's house'. "Women's Residence is the former nineteenth century Masson farmhouse. A house is noted in the middle of Lot 121 Concession 5 on the East Whitby map in the 1877 Illustrated Historical Atlas. 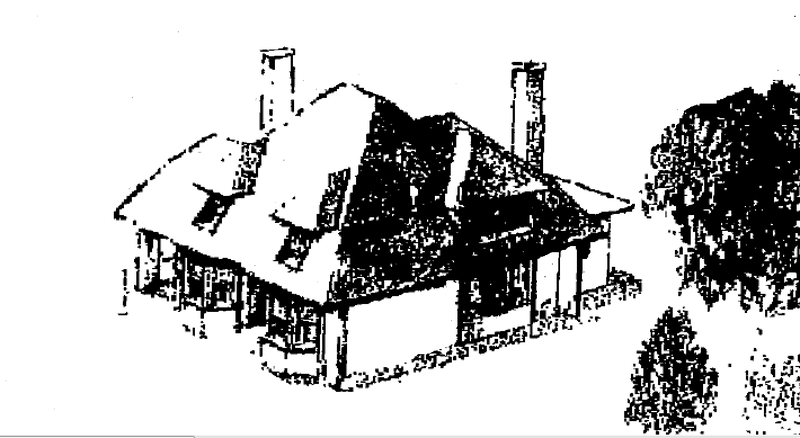 The 1901 Census records a large wood dwelling with ten rooms on Lot 12" George W. renovated the two storey frame farmhouse for his son Ray McLaughlin soon after his purchase of the property in 1917 "
After George W. McLaughlin's 1917 renovations it became the Elmcroft farmhouse for Ray McLaughlin. 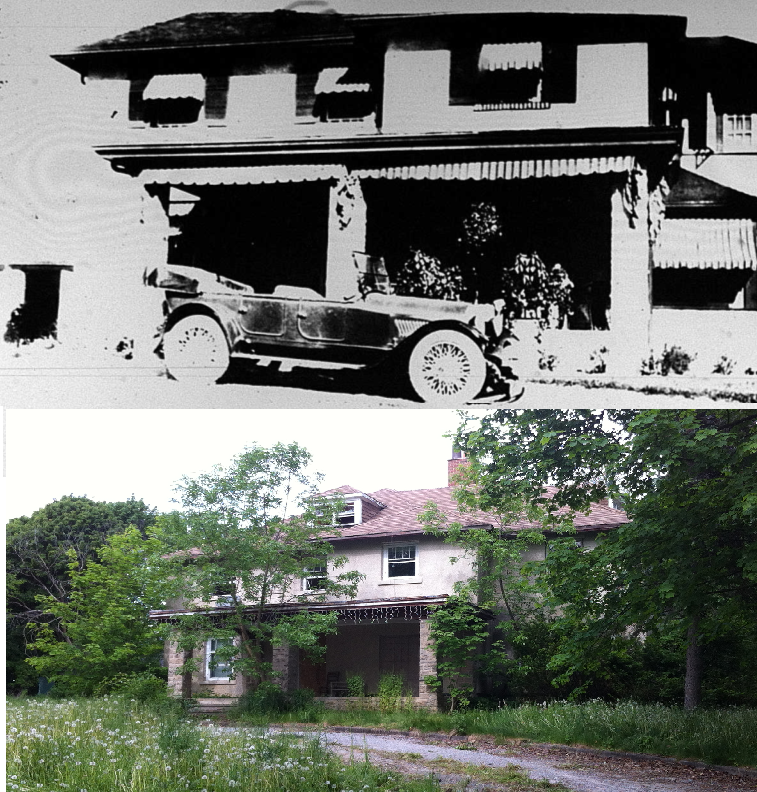 Pictured below top is the house in 1921 with a McLaughlin Buick car in front, and below bottom as it appears today May, 2012, boarded up for demolition. Aerial photo of section of Minto property on Simcoe St. east side, just north of Britannia Rd showing location of the two heritage houses on Minto property. JAMES SHAND who is a native of Scotland, settled on the Reach Road in the 5th concession opposite Andrew Mason's farm in the year 1838. Mr. Shand's substantial stone residence gives the passer by an impression that the owner is a prosperous resident. In this instance such a conclusion would be a correct one. Mr. Shands nearly sixty years residence in Whitby has given him abundant opportunity to assist in the development of the agricultural interests of this township besides adding largely to his worldly possessions. He has been an industrious tiller of the soil, which taken one year with another has yielded him profitable results. Mr. Shand is now well advanced in years, but as of old he takes a deep interest in the country's advancement and proper government. 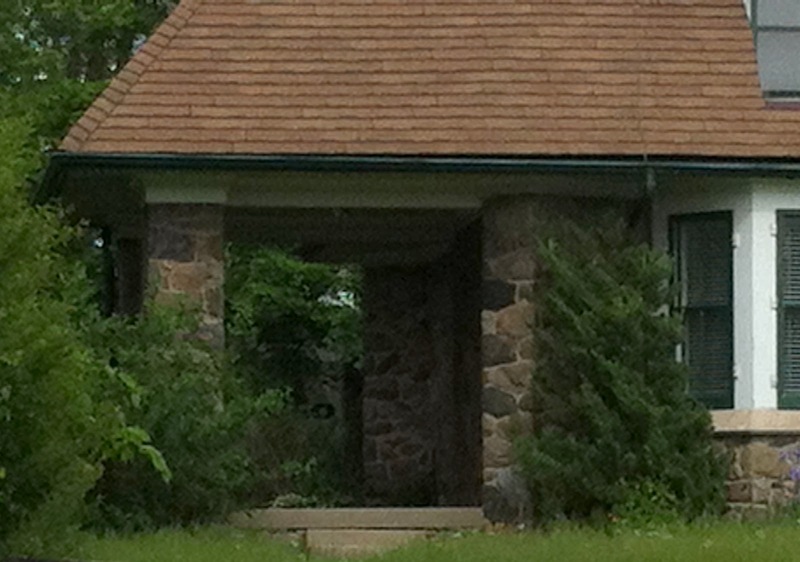 Built by George W. McLaughlin, the authentic Craftsman-style stone cottage is important to Oshawa and should be protected. It is in the public interest that the City facilitate a better plan with the developer and not allow it to be demolished or moved. 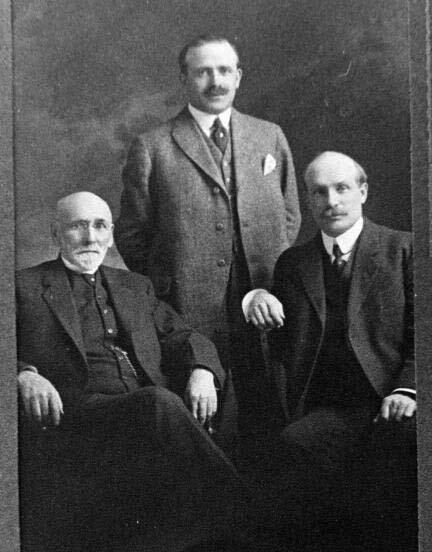 The founding family of the successful McLaughlin Carriage business which moved from Enniskillen to Oshawa in 1876, went on to became the largest carriage building industry in the British Empire; later the McLaughlin Motor Company (incorporated 1907) and General Motors Canada (incorporated 1918). In 1917, 10 years before R. S. McLaughlin bought land on the west side of Simcoe St. N. for his Parkwood Stables his older brother George purchased 200 acres on the east side for his Elmcroft Farm. 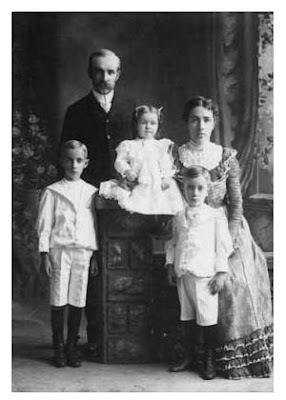 George William McLaughlin, older brother and business partner of Robert Samuel McLaughlin of General Motors fame, was the third of five children born to parents Robert and Mary McLaughlin. At an early age George showed an interest in the carriage business owned by his father. He began his apprenticeship with the company by age 16, working first in the trimming shop. In the early days there were no conspicuous advantages to being the boss’ son. George worked 70-hour workweeks, earning $3.00 per week less $2.50 which was deducted for room and board. His personality was well suited to salesmanship, and by 1892 he had become a junior partner in the McLaughlin Carriage Company. A year later, in 1893, George married Annie Hodgson. Annie had grown up in Tyrone, across the road from the McLaughlin homestead. She and George would have four children – Ewart, Ray, Dorothy and Kathleen. 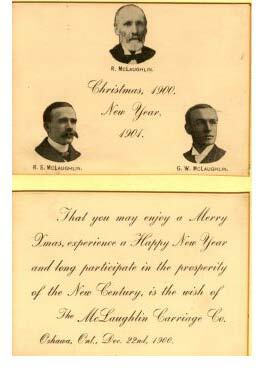 In 1907 the McLaughlin Motor Car Company was formed. With George as Treasurer, the McLaughlin’s began producing Buick car bodies for the Buick Motor Company of Flint, Michigan. By 1915 they were producing Chevrolets. The carriage company had been sold to Chevrolet Motor Company, and the Chevrolet Motor Company of Canada Limited was incorporated, with George as President. 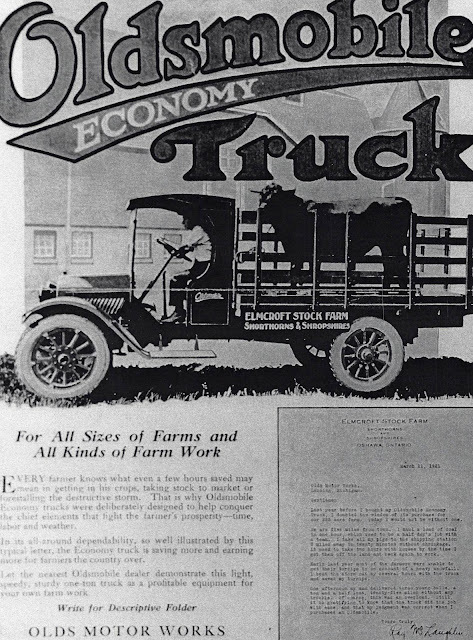 In 1918 General Motors purchased the two businesses. Younger brother Sam became President of the newly incorporated General Motors of Canada, while George fulfilled the role of Vice-President until his retirement at the age of 55 in 1924.
in one hour which used to be half a day's job with a team". George was not idle in his retirement. He remained on the boards of various companies, and his interest in them continued. He also turned his attention to farming, which had been a life-long interest. He purchased the family farms around Tyrone and land to the north of Oshawa and established progressive farming operations, importing pure-bred cattle which benefited in farming Ontario and Canada. Known for his Clydesdale horses and Holstein cattle- earned the distinguished title of “Master Farmer” for his contributions to farming. In his lifetime, George stood humbly in the shadow of his younger brother Sam, making generous contributions to the community with much less fanfare and publicity. He was modest about his philanthropic activities, about the large amounts of time and money he devoted to community services and civic improvements. George was the first president of various newly formed groups in Oshawa, including the Oshawa Welfare Board, the Boy Scout movement in Oshawa, and the Oshawa Chamber of Commerce. He involved himself with the Children’s Aid Society, serving as President for a while, and devoted some of his best years to municipal office. George and Annie made numerous donations towards school and church improvements, the Salvation Army and the Red Cross. George served on the Board of Education and as Superintendent of the Sunday school at St. Andrew’s United Church, both for many years. 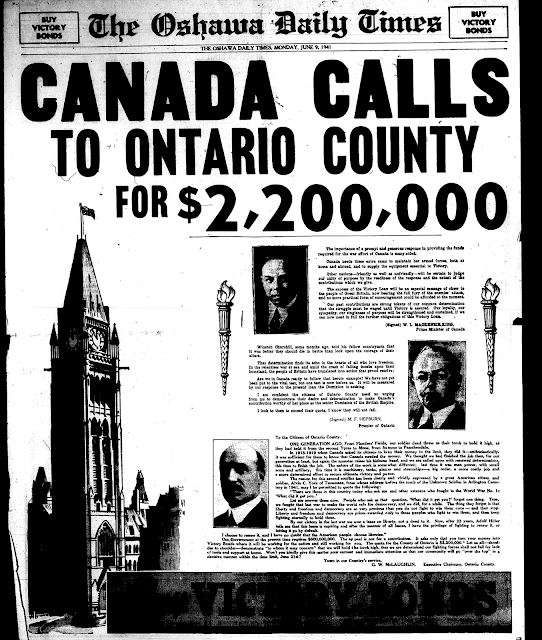 In 1920 George and his brother Sam bought the land that would become Lakeview Park and sold it to the Town of Oshawa for one dollar. Sam and George also donated the McLaughlin maternity wing to the Oshawa General Hospital, and contributed generously to the hospital endowment fund over the years. On July 1, 1922 George McLaughlin presented the Union Cemetery to the Town of Oshawa. He had purchased all outstanding stock of the holding company that operated the cemetery and turned it over to the town, making the cemetery a municipal affair from that point onward. He also generously donated $500 towards the creation and upkeep of a soldiers’ plot in the cemetery. A monument donated by George was erected in the cemetery in honour of the “boys from Ontario County, who served, fought and died for Canada in the Great War”. His contributions to the automotive industry, to farming, and to the community are the legacies for which George McLaughlin should be remembered. A Pictorial Biography of George W. McLaughlin (CD produced by and with the permission of Mary P. Hare) - MBE. Henderson, Dorothy. Robert McLaughlin: Carriage Builder, Griffin Press Ltd., 1972. Petrie, Roy. Sam McLaughlin. Fitzhenry & Whiteside Ltd., 1981. Robertson, Heather. Driving Force. McClelland & Stewart Inc., 1995. "Sons of the soil joined hands with children of the city for one evening of whole-hearted tribute to a leading citizen of this community, George W. McLaughlin, who has won the respect and admiration of both classes and has earned the rightful claim to kinship with rural and urban dwellers alike. The occasion was the complimentary dinner tendered to Mr. McLaughlin by the South Ontario Agricultural Society at the Genosha Hotel last night in recognition of the meritorious services he has rendered to agriculture. The function was rich in the sincerity and warmth of the tribute and recognition accorded the guest of honour. Speaker after speaker in the galaxy of eminent personages who addressed the large gathering extolled and lauded his keen interest in things agricultural and the contribution which this this interest had made to the industry not only in this immediate district but in the province and dominion generally." George W. McLaughlin (1869-1942) was the son of Robert McLaughlin, founder of the McLaughlin Carriage Company and brother of Robert Samuel McLaughlin, President and General Manager of General Motors. George W. was also a prominent businessman in his own right serving as Vice-President of General Motors of Canada and its predecessor companies of McLaughlin Motor Car Company and Chevrolet Motor Company. He retired from General Motors in 1924 and took on the management of the family's farm properties in Tyrone and north of Oshawa. McLaughlin was well-respected in the agricultural community. He and his wife Annie Hodgson had four children including Robert Ray McLaughlin. 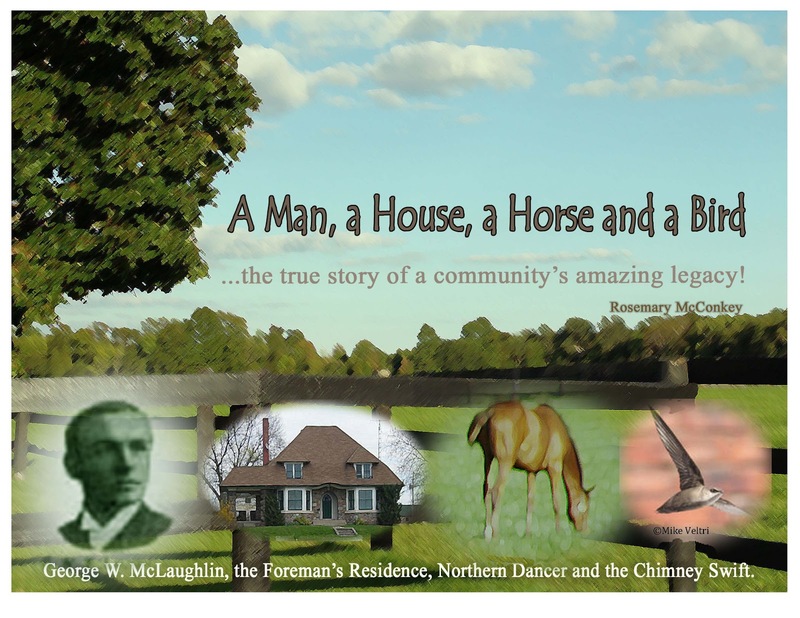 Robert Ray McLaughlin (1895-1948) was born in Oshawa and attended the local public and high schools.. George W. McLaughlin acquired the Masson farmstead on Simcoe Street in 1917 on Lot 12, Concession 5. His son Ray McLaughlin lived at and managed Elmcroft Farm for over 30 years. Elmcroft Farm expanded its holdings beyond Lot 12 over the years acquiring land in Lots 11, 13, 14 and 15. Elmcroft specialized in livestock breeding and operated a well-known Ontario dairy farm. Elmcroft Farm was one of the heaviest milk shippers in Ontario with most going to the Oshawa Dairy. Ray McLaughlin developed a Holstein dairy herd of internationally renown. He sold cattle to Argentina and other South American countries.. He served on the executive of the Holstein-Friesian Association for twenty-five years. Ray McLaughlin was also interested in raising Clydesdale horses winning the Grand Championship at the 1946 Royal Winter Fair in' Toronto. McLaughlin also did volunteer work with the Oshawa Boy Scouts organization.. Upon his father's death in 1942, Ray McLaughlin took over the management of the original Robert McLaughlin farmstead in Tyrone which was run separately from Elmcroft Farm..
On September 23 1948, Ray McLaughlin was killed on his farm by a premature blast of dynamite. The funeral was held at Elmcroft Farm. Son George R. McLaughlin took over the farm operations and continued to run it until November 1956 when the National Stud Farm purchased 438 acres of Elmcroft Farm in Lots 11, 12 and 13, Concession 5, including the buildings thereon. 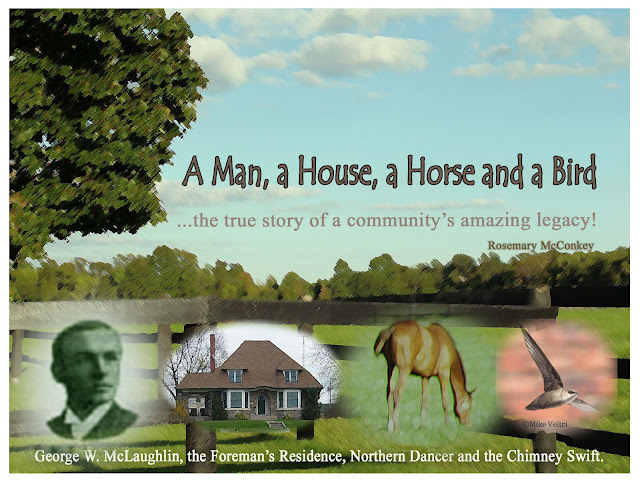 McLaughlin sold his last five acres to the National Stud Farm in 1960. ...devoted a lifetime to his passion for developing Canadian Agriculture. Mr. McLaughlin served as the founding Chairman of the Ontario Milk Marketing Board, where he provided integrity, leadership, vision, insight and determination to create one of the premier farmer organizations in Canada. From the beginning George McLaughlin set out to make the OMMB a successful commercial marketing enterprise, second to none in the world. He built a cohesive, well-disciplined organization and hammered out a blueprint to provide order and efficiency to a milk marketing system. He ensured an adequate flow of information among all stakeholders, George provided the fulcrum to launch milk supply management, market expansion, milk recording, milk quality, multiple component testing and pricing and active participation in the International Dairy Federation. George was an extremely successful dairy and sheep farmer near Oshawa and Beaverton, who took over the family farm shortly after graduating with a BSA from the Ontario Agricultural College in 1946. He diligently searched for and implemented innovations to improve his farming operations. The result was the Elmcroft Holsteins line of breeding stock and the production of hybrid sheep breeding stock for the commercial market. 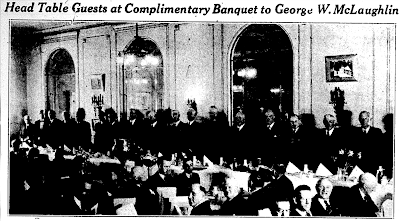 In 1974, George was awarded the H.R. McMillan Laureate in Agriculture recognizing his contributions to agriculture and citizenship. In 1977, Mr. McLaughlin was made a member of the Order of Canada, the highest honour for lifetime achievement in our country. Mr. McLaughlin served as President of the Dairy Farmers of Canada, President of the Holstein Association of Canada, President of the Ontario Institute of Agrologists and founding Chairman of the Ontario Sheep Marketing Agency. He served as Chairman of the Farm Debt Review Board from 1986 and 1995, where he developed programs instrumental in helping dedicated producers through the debt crisis by searching for win-win solutions. His judgements were founded on four concepts: to hear courteously, to answer wisely, to consider soberly and to decide impartially. An active consultant on agricultural policies and programs with governments and organizations George McLaughlin, through his lifelong contribution of outstanding leadership to Canadian agriculture, has earned a place in the Canadian Agricultural Hall of Fame. George R. McLaughlin moved into the stone house and took over his father's Elmcroft farm after the untimely demise of his father and lived in it with his family until the McLaughlin sale to E.P. Taylor's National Stud Farm (Windfields Farm) in 1956. 2006 revisions to Ontario Building Code Act to speed up building and demolition permit turn around times (10 days for demolition permit); also revisions to the Ontario Heritage Act to add balance to a municipality's ability to protect heritage buildings that might be threatened, the owner is to give 60 days notice to a municipality of an intention to demolish, and the municipality is to keep an annual inventory of heritage 'identified' properties. 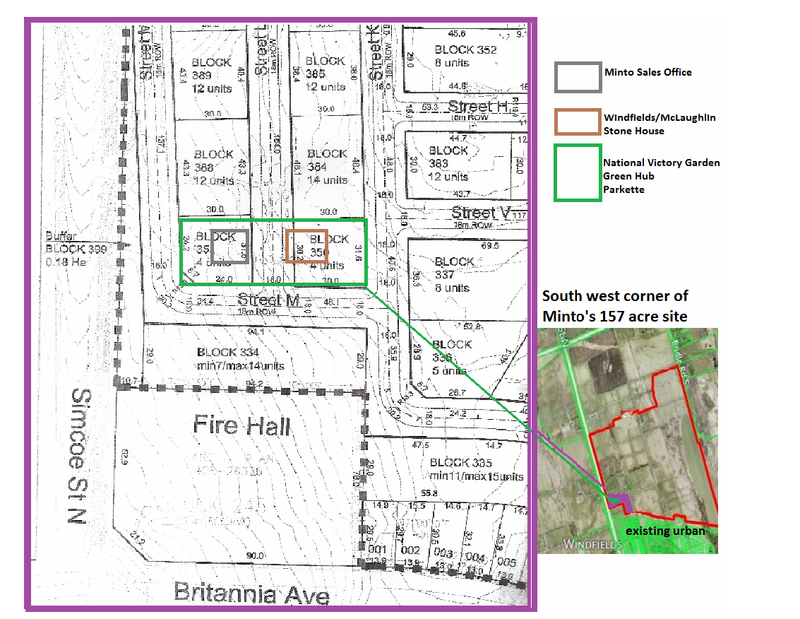 2011 page 8 of 2011 Oshawa's Inventory of Heritage Homes '1 and 1/2 storey stone house on the east side of Simcoe St' is still listed with same note about "plans to move utilize/incorporate into fire hall"
April 2010 City of Oshawa purchases from Tribute (Windfields) two acres at the n/e corner of Simcoe and Britannia Rd for a future fire station, immediately south of the stone one and-a-half storey 'Foreman's residence'. HTG-11-51 Presentation – re “application submitted by Minto Communities (Toronto) Inc. to amend the Oshawa Official Plan, Windfields Part II Plan, Zoning By-law 60-94, and a Draft Plan of Subdivision on the east side of Simcoe Street North and north of Britannia Avenue and requested comments from Heritage Oshawa. It was reported that a Heritage Impact Study completed on the site in 2002 identified the Women’s Residence, the Foreman’s House, a barn and a garage as well as landscaped areas related to these structures as having heritage features. 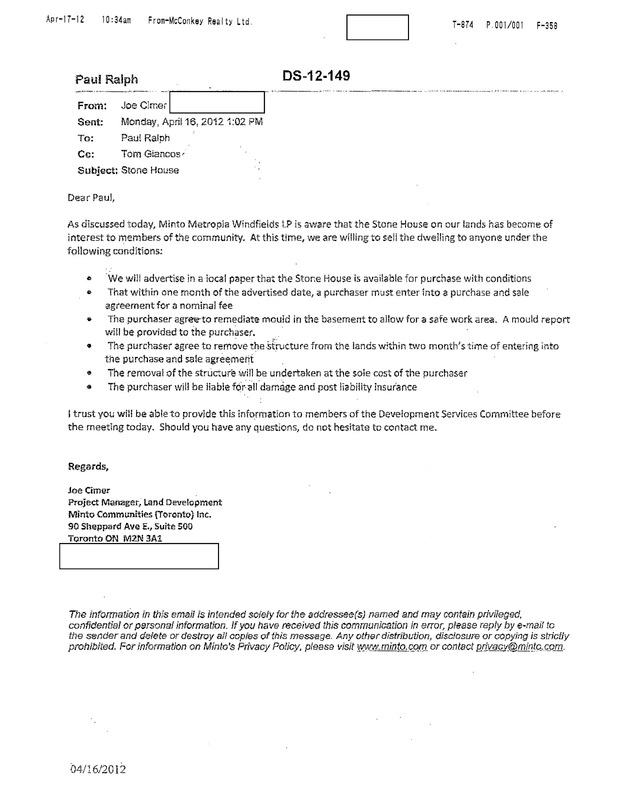 July 20, 2011 First Public Planning Meeting for the Minto Metropia draft plan is attended by only one member of public. 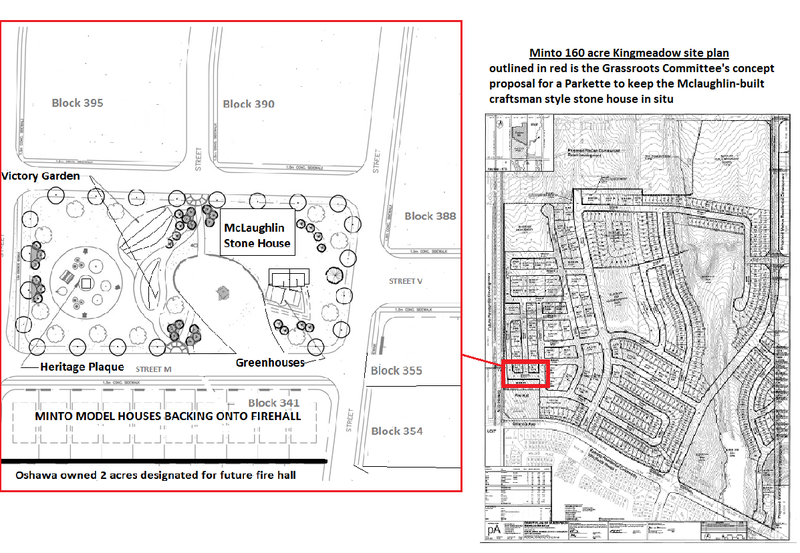 December 2011 Minto applied to Oshawa Committee of Adjustments for approval to construct a Sales Pavilion in front of the 1 and 1/2 storey stone Foreman's House before draft plan approval! March 5, 2012 Minto/Metropia applied for a demolition permit and City staff signed approval. 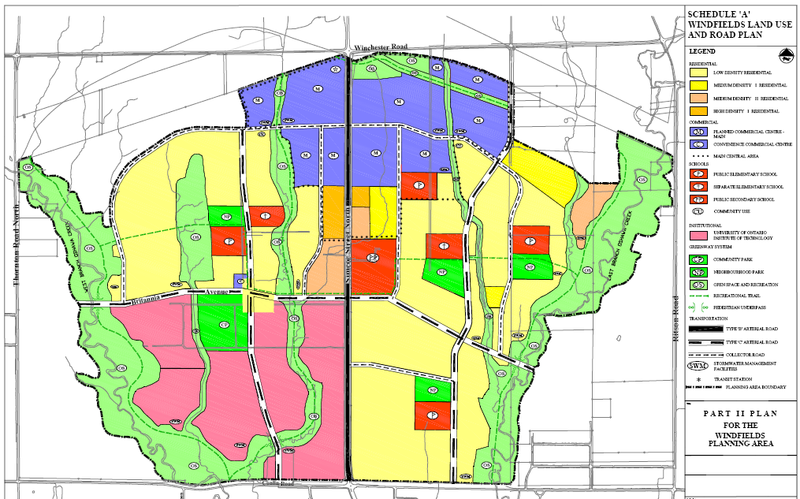 March 26, 2012 Second Public Planning Meeting for Minto/Metropia. 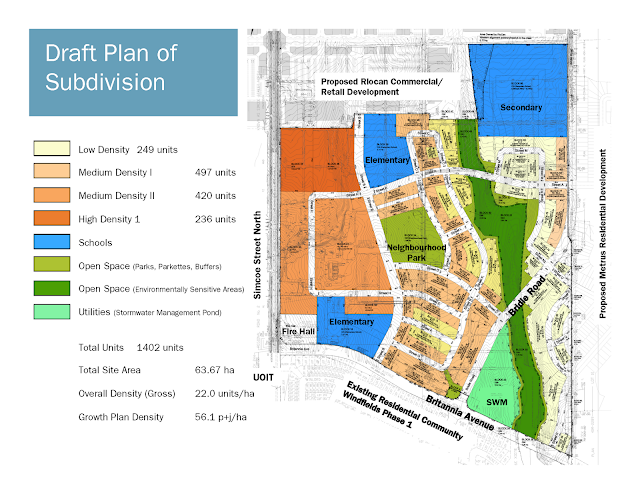 Developer representatives present revised draft plan of subdivision, Several changes from First draft plan, 1400 residential units down to 900, alter location and size of sites proposed for schools, roads, parks and greenspace. During public question period Rosemary McConkey questions the developer's representatives about the stone house. They reveal that the house is to be torn down. 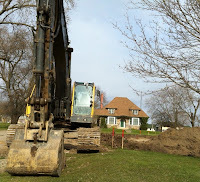 April 2, 2012 objection to a demolition permit being issued is sent to City and a public campaign to honor the McLaughlin/Windfields legacy and rescue the heritage stone house from demolition begins on facebook. Grassroots movement continues to grow with media coverage and letters to the City. April 4, 2012 Oshawa Express article "Residents worried stone house could be destroyed"
April 10, 2012 Rosemary McConkey and Joan Kerr make delegations to Oshawa Council and petition City to have serious discussion about Windfields 'heritage' preservation with Minto. 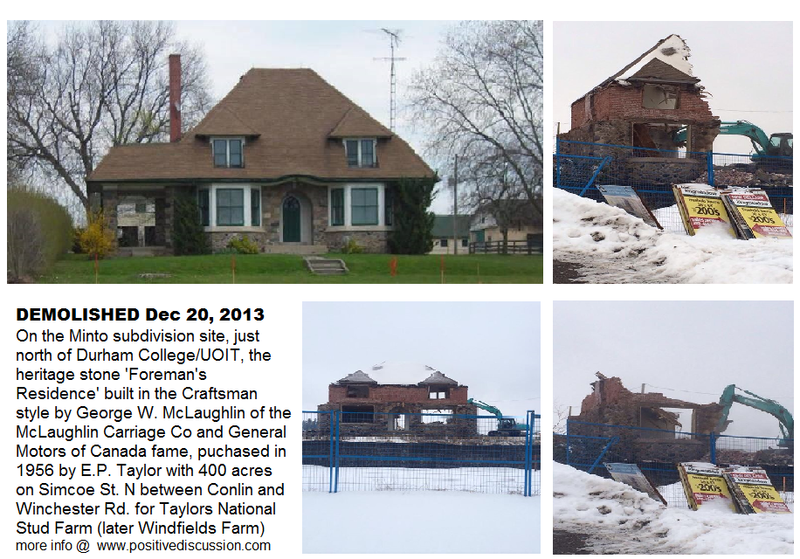 Council refrains from discussing the matter, avoiding discussion about the planned demolition of the stone house by dividing discussion about Windfield's heritage into 'west' and 'east' side of Simcoe St. and indicating the matter of the 'east' side will be on the agenda for the following week's Development Services Committee meeting. April 16, 2012 Four delegations: Paul Andre LaRose, Rosemary McConkey, Joan Kerr and Cathy Clarke and many letters on the Oshawa Development Services Committee agenda, voicing concern and petitioning the City and Developer to discuss alternative plans that will preserve and protect this important part of Oshawa's history. Prior to delegations Chair John Aker reads email from Minto stating it will advertise the stone house for sale to be moved. Surprisingly at this meeting Committee members make no comments and have no questions. To date there has been no public discussion whatsoever by any elected member of Oshawa Council on this matter. 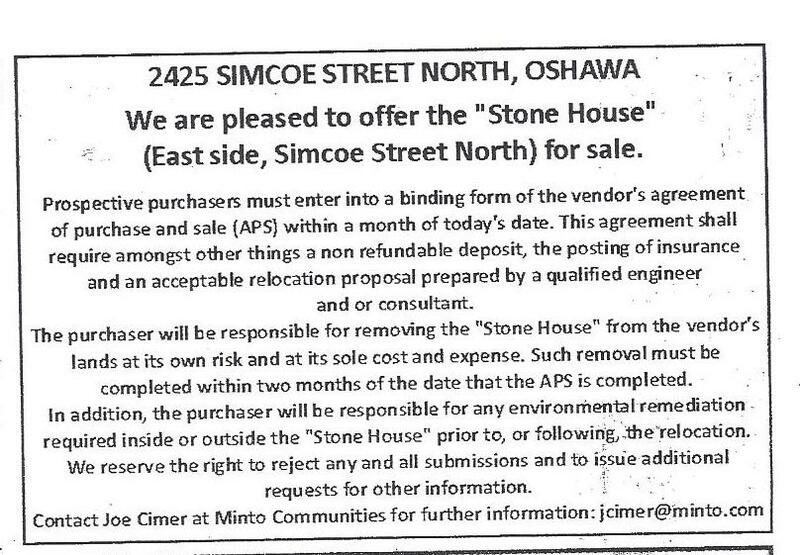 Minto newspaper ad re: moving the stone house. 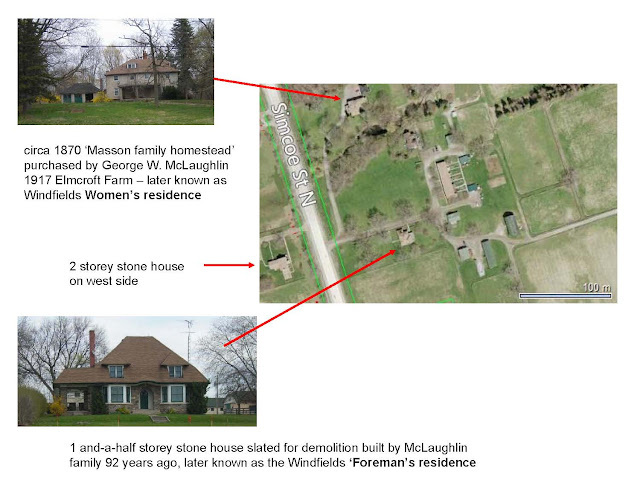 Note: no mention of 'Windfields' location or history of McLaughlin family and E.P. Taylor ownership. 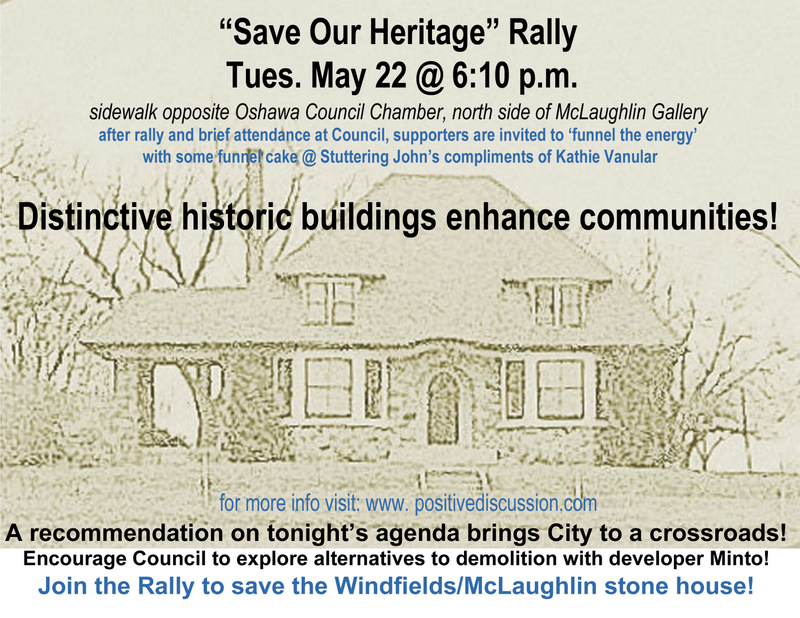 Successful Rally in front of the Windfields stone house prior to the 2:00 -4:00 p.m. time scheduled by Minto for people interested in moving the historic structure. Great community involvement! Lots of cars honking their horns for heritage! Message well delivered with good media coverage. Link to CHEX news "Honk for Heritage Rally"
Six weeks ago we came to you with a concern about the Windfields stone house on the east side of Simcoe St. N.. It was when the public first unexpectedly learned that Minto intended to tear down the historic house built by the McLaughlin family. Up until then it was well known and part of your public record that the stone house was going to be moved next door to the city owned future fire hall property. 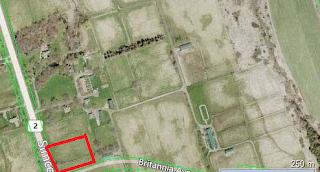 From the moment when we first appeared before you at Council and Committee you have continued to indicate that your interest in the Windfields heritage lies soley on the west side of Simcoe St. with the horse cemeteries and the some of the barns. This seems a silly delineation. Almost a way of distracting from the issue at hand. The east side actually is the only place where there currently is the threat of demolition. 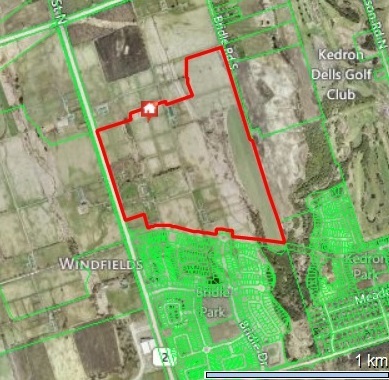 Besides both sides of Simcoe St. N. have been the entire Windfields Farm. 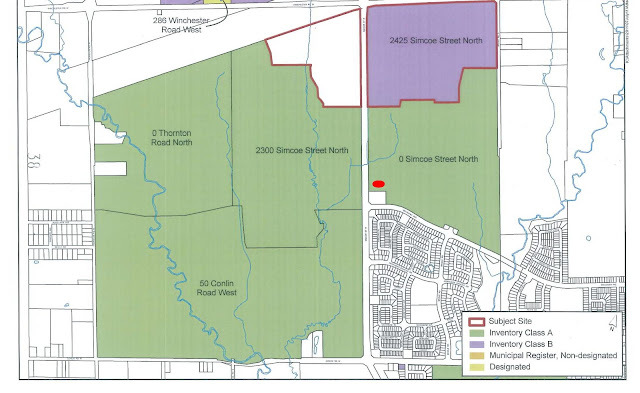 Your Windfields Part II Plan approved by Council is, and has been for a decade now, for both sides of Simcoe St.
To arbitrarily cherry pick which heritage assets you give consideration to and for you to make an east/west divide or for that matter north south divide is inappropriate. Now on tonight's Agenda you have your own heritage municipal advisory committee making an excellent recommendation. They are asking you, as we the members of the community have been for the past six weeks, to start a dialogue with the developer to come up with alternatives to demolition. Many in the community believe you should support their recommendation. The developer is not the issue. It is this council not giving the signals to staff that this is important.
. You have indicated to the public and the media you have no stewardship of this land. This is surprising since you actually have no more stewardship over the Windfields horse burial site on the west side. You were not a party to the agreement between Windfields and the College and University, They have autonomy over their lands. Fortunately your recent inquires have reassured the public that the Taylors and the College have a covenant on title to protect the burial grounds. I'm not sure why you are minimizing the City's stewardship role in how the Minto draft plan of subdivision will be approved. You have a say in the densities, the location and size of the park land and open space dedicated, the layout of the roads and you have in your strategic plan that you have a goal to preserve heritage. 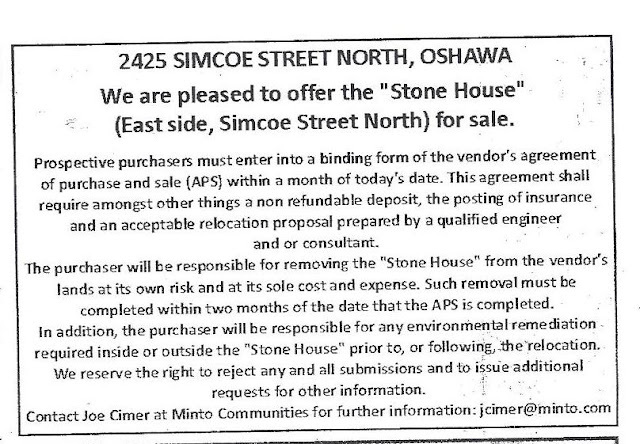 Then Minto got wind of the community's concern and notified you and the public that they would entertain offers to move the stone house. They gave until this week for someone to come forward and pay for a move. What happens if no one comes forward? 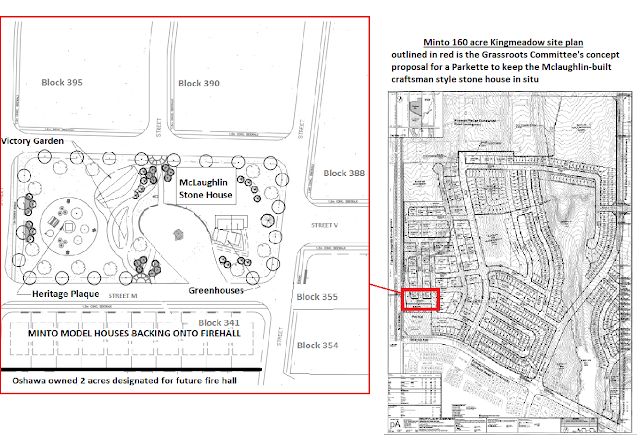 Recently a Grassroots Proposal was sent to the Minto Group regarding the Windfields/McLaughlin stone house on Simcoe St. N., Oshawa. The attached is just one potential concept among many ideas. Others include a respite hospice or a green living centre. Please consider how the distinctive characteristics of a place play a key role in a community being desirable and economically vibrant! The unique qualities of a community's landscape and buildings bond people to where they live. In particular, the appeal of heritage buildings strengthens a sense of place and belonging - as they evoke past memories, bolster image perceptions in the present and stimulate feelings of caring for a community’s future. 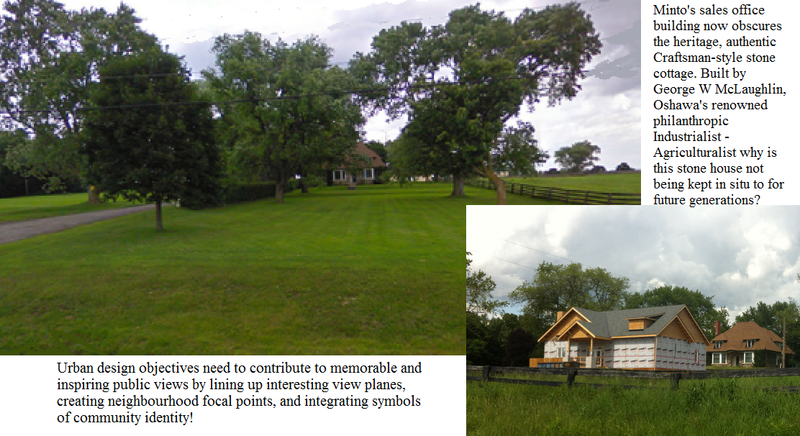 With the city expanding and in light of the fact that the community will be losing the distinctive Windfields Farm landscape along it’s northern gateway corridor, this message is something that might inspire Oshawa politicians, planners and the developer to recognize the social and economic benefits associated with keeping the distinctive heritage stone house, Simcoe St. N. east side in situ. 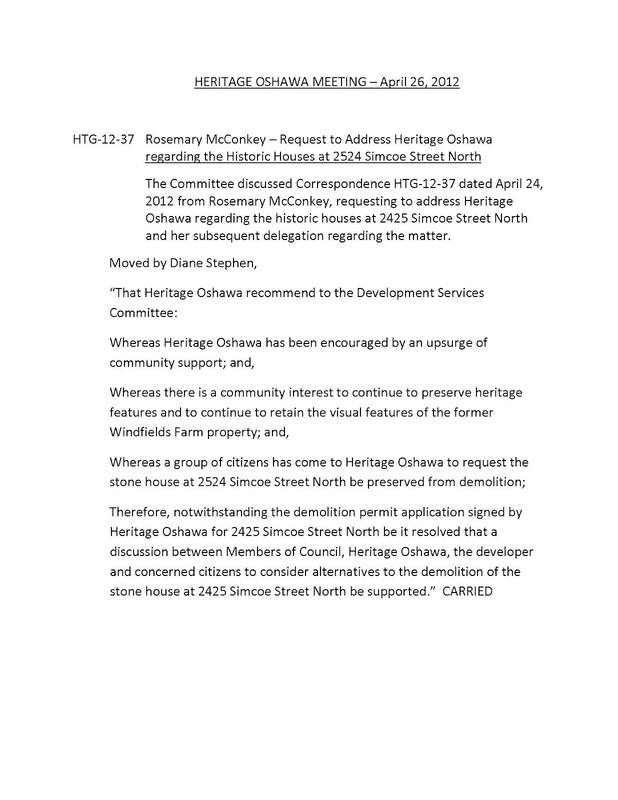 On the agenda for the Tuesday, May 22nd evening Council meeting is Heritage Oshawa’s recommendation: “notwithstanding the demolition permit application signed by Heritage Oshawa for 2425 Simcoe Street North be it resolved that a discussion between Members of Council, Heritage Oshawa, the developer and concerned citizens to consider alternatives to the demolition of the stone house at 2425 Simcoe Street North be supported”. Minto has a motto ‘be inspired’ and its corporate report has stated that: “It’s our vision and our purpose: to always go a little bit beyond. Because a little bit makes all the difference”. 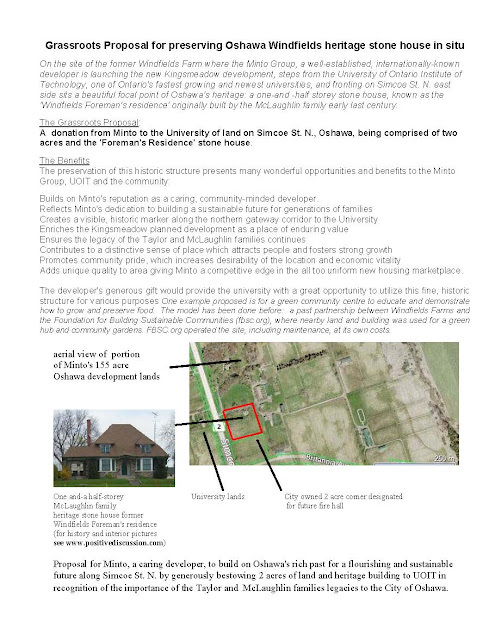 This is a wonderful opportunity for the City of Oshawa be inspired and go a little bit beyond, to make a difference and work with Minto to come up with a better plan of subdivision that includes the Windfields/McLaughlin stone house. The community sees many amazing opportunities available to save this stone home with no added expense to the taxpayer. It’s simply a matter of starting the dialogue to consider alternatives as recommended by the City’s own advisory committee. 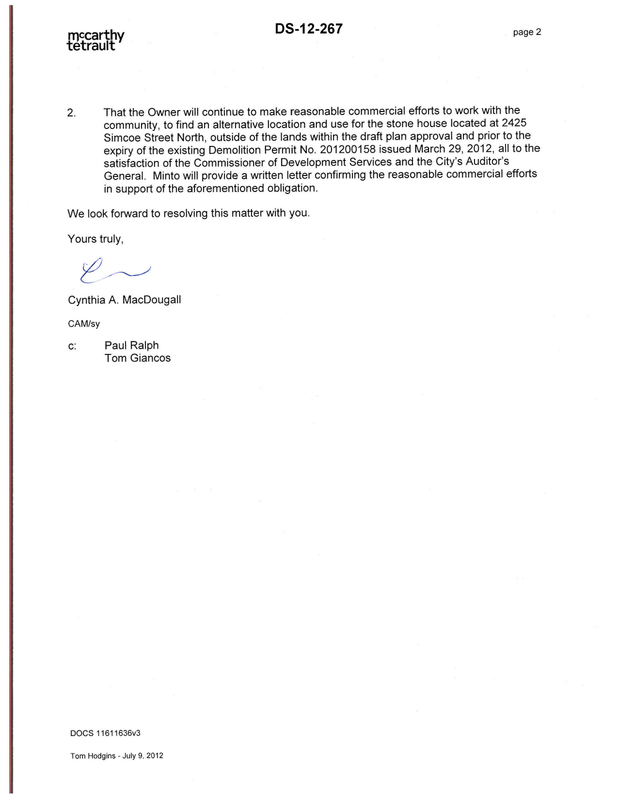 May 22, 2012 Oshawa Council. by close 6-5 vote refers matter back to Development Services Committee. 1. The architectural significance of the stone house. 2. The historical significance of George W. McLaughlin to Oshawa. 4. To impress elected officials to Use Heritage, Not Lose Heritage! the benefits being distincitve heritage buildings become markers that tie people to their community, and help them love where they live, which encourages economic, social and cultural vitality! And the good publicity that Minto, the developer, stands to gain will far out weigh any costs in assisting in keeping the building. May 30, 2012 Oshawa Express Editorial "East vs West at Windfields"
and newspaper article "Stone House Advocates Not Backing Down"
At conclusion of this consultative meeting, Minto Land Development managers indicate need for time to consider the request to reexamine their draft plan and the information the Steering Committee brought to the table related to the significant history and architecture of the stone house. A follow up meeting will be scheduled sometime in July. 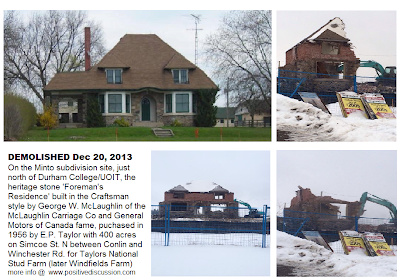 A 'stay of demolition' has been granted by Minto, the developer/owner of the distinctive heritage stone house located on the site of their new Kingmeadow development in Oshawa. 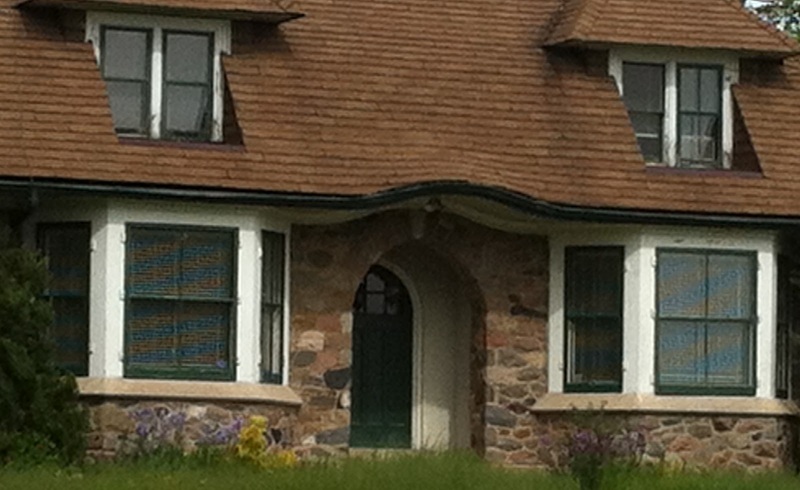 The authentic craftsman-style stone cottage, built by esteemed, philanthropic industrialist/agriculturalist, George W. McLaughlin at the turn of the last century for his Elmcroft Farm, is a well-known and visible marker on the east side of Simcoe St. N., just north of the University of Ontario Institute of Technology and Durham College. Minto obtained a demolition permit for this building, referred to as the Windfields Farm "Foreman's Residence", in March. 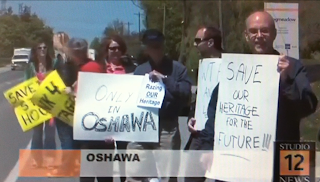 Since then a grassroots community movement has grown spontaneously with citizens working in a concerted effort to raise awareness and encourage Minto and members of Oshawa Council to use heritage not lose heritage. 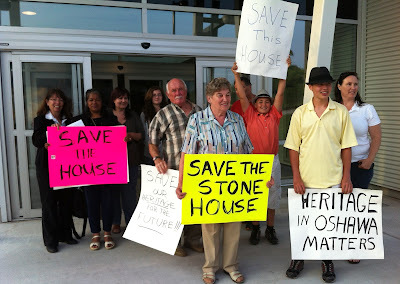 After two public rallies and attendance before Oshawa City Council, the members of the Save Our Heritage, Save the Stone House Steering Committee met this week in Toronto with Minto Land Development and Project Managers to convince them of the benefits of making heritage work to the benefit of the current and future generations. The concerned citizens' message was that a community that can define itself through preservation of its past gives its citizens a sense of belonging, and contributes to a City's character and vitality. Youth especially are effected by a community's identity when linked only to subdivisions and strip malls. It is a good news story inching forward with Minto agreeing to hold off on demolition until they have considered in more detail the historical and architectural information that the grassroots activists gathered and presented. 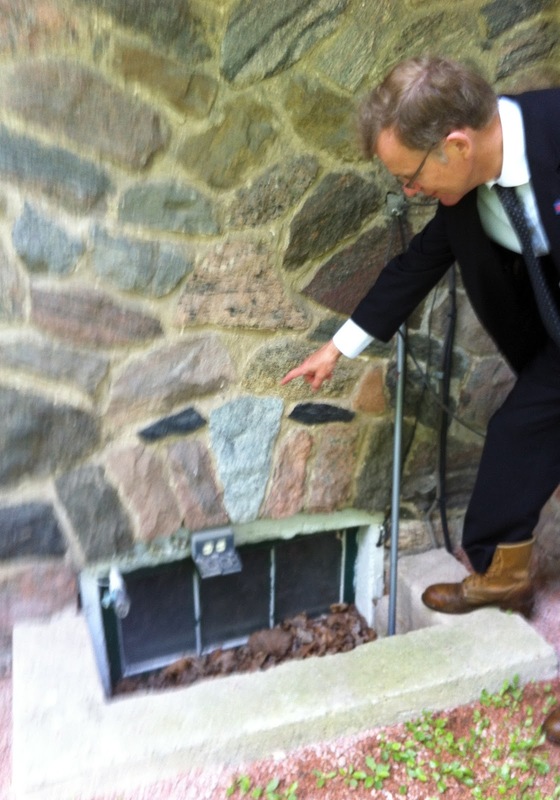 the rescue of the Windfields/McLaughlin stone house spells a win/win for Minto and Oshawa. Minto has agreed to meet again in early July to discuss the matter further. Background: former Windfields Farm site, Minto sales pavilion under construction in front of historic stone cottage, one of the finest examples of an authentic Craftsman-style house in Canada representative of the Arts and Crafts movement. June 7, 2012 CHEX TV COVERAGE:"One Step Closer to Saving the Stone House"
"Storied Stone Home in Oshawa"
"Residents of Oshawa Fight to Save Century Old Home"
Last month Heritage Oshawa made a recommendation that Council discuss alternatives to demolition with Minto and Council voted 6 to 5 to send the matter back to Development Services Committee. The Committee, however, has subsequently twice tabled the matter. 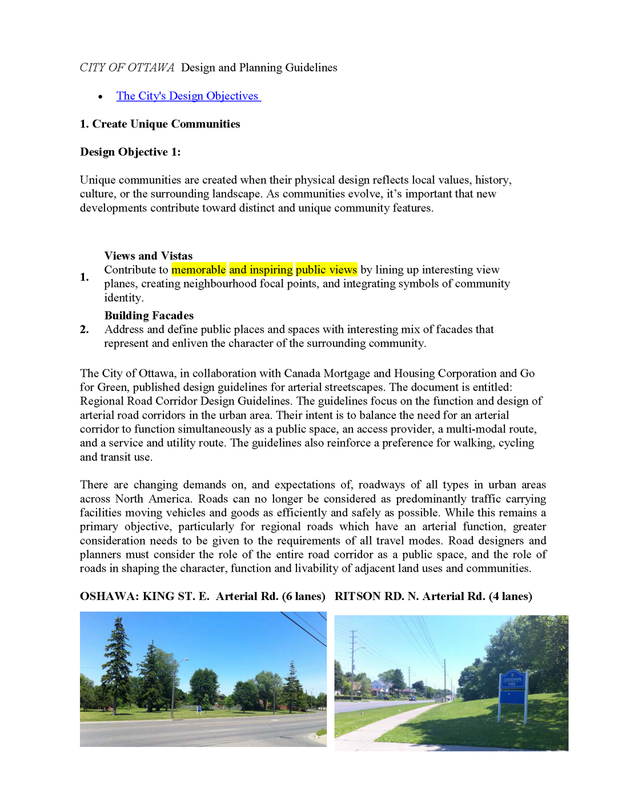 This week, to inspire Oshawa to be more proactive, the grassroots community group made another delegation to Development Services Committee and provided the attached one page submission citing the exemplary planning guidelines of the City of Ottawa. 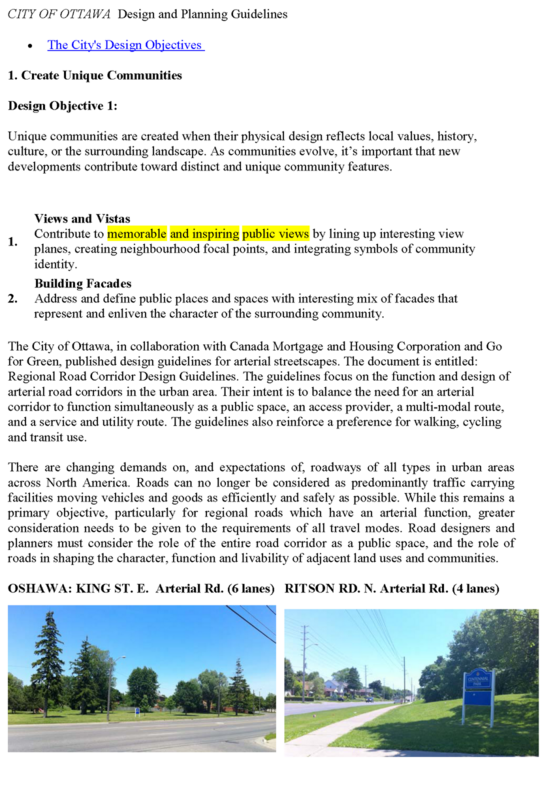 Ottawa's urban design objectives affirm the importance for new developments to contribute toward distinct and unique community features with memorable vistas and views. Noting in particular how Ottawa's guidelines for arterial road streetscapes state "road designers and planners must consider the role of the entire road corridor as a public space, and the role of roads in shaping the character, function and liveability of adjacent land uses and communities". June 19, 2012 and June 20, 2012 Michael Penny posts on his well read Michael Penny Style blog "Local History About to be Destroyed" and "Threatend George McLaughlin House Interior and many of his blog followers from around the world post comments. 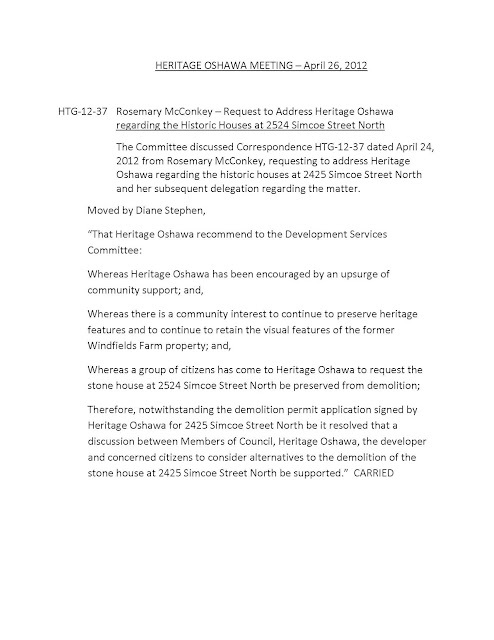 June 22, 2012 As the George W. McLaughlin heritage stone house is located on Simcoe St., a Region of Durham arterial road, the above June 18th submission to Oshawa Development Services Committee is also forwarded to the Regional Municipality of Durham and Minto for consideration. 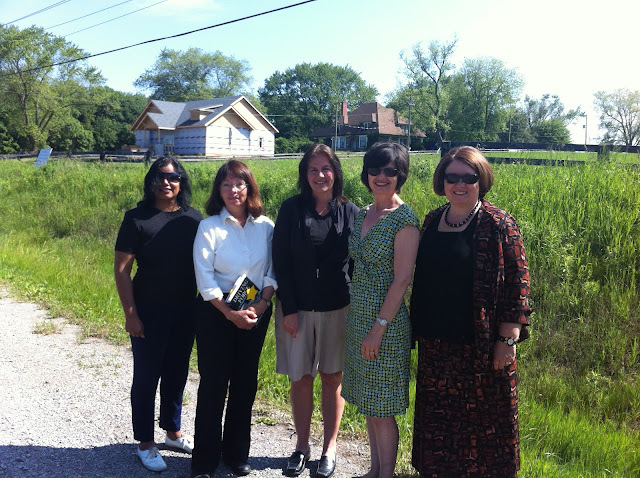 June 29, 2012 on the radio: 'Goldhawk Fights Back' Rosemary McConkey speaks on Goldhawk Fights Back 740 AM radio about the grassroots community effort to retain the Windfields/McLaughlin stone house in Oshawa. 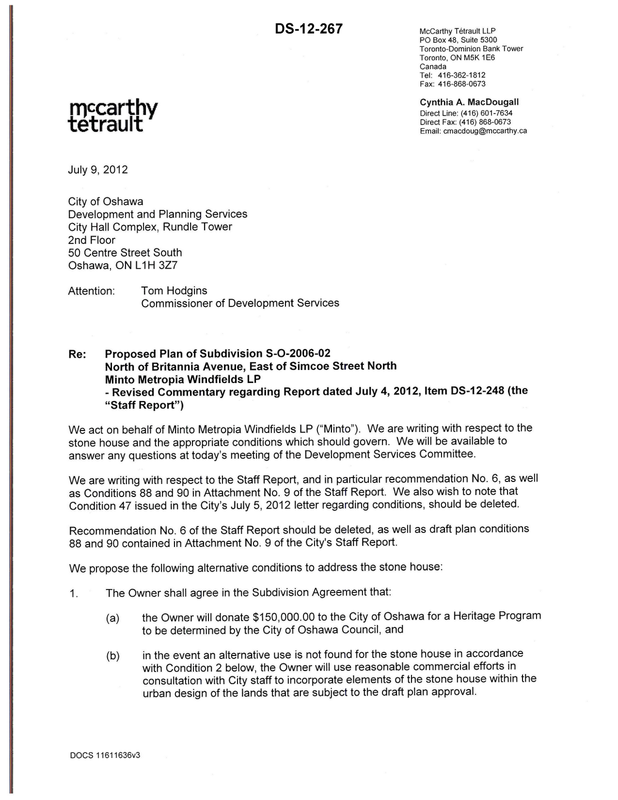 Dale Goldhawk gets it "the developer Minto could incorporate the McLaughlin stone house into their plan of subdivision"... 'marry new and old'. Rosemary says "EXACTLTY! but only that someone dropped the ball and Oshawa citizens are trying to help them pick it up." Finally Development Services staff are taking a proactive approach and formulating recommendations to save the stone house. may be created through a future revision to the draft plan of subdivision. (b) Place, at its cost, the house on a new foundation. (c) Agree to withdraw the demolition permit for the house once draft plan approval for S-0-2006-02 is in effect. (d) Not-oppose the City's efforts to appropriately designate the house under the Ontario Heritage Act and agree to advise any purchaser of the City's intent to designate. (e) Properly maintain the house while it remains in Minto's ownership. At the morning meeting with Minto Land Development Manager Tom Giancos, the grassroots discuss a proposal to leave the house in situ with sustainable funding. One of our Steering Committee members has just received federal funding for a national Victory Garden. It ties in well with George W. McLaughlin being instrumental in donating Union Cemetery to the City, erecting a memorial for WWI veterans and being a driving force behind WWII Victory Bonds. 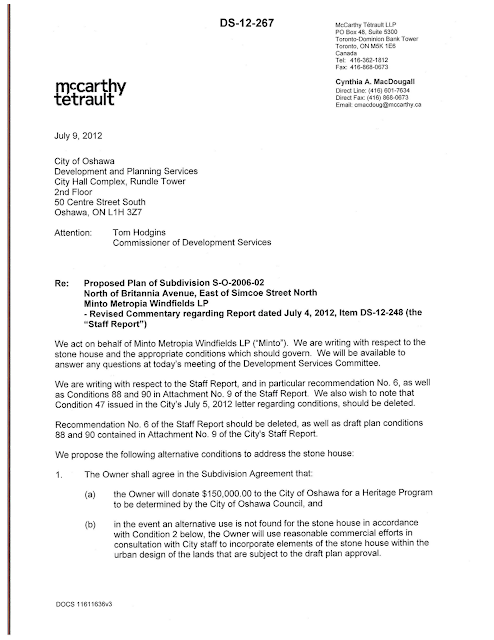 Unfortunately Tom Giancos doesn’t mention that Minto has already prepared a replacement motion in response to the conditions in the July 4th Report DS-12-249 and in consultation with Mayor Henry had concessions from the city based on a $150,000 payment to the City for a Heritage Fund. The grassroots is disadvantaged at the afternoon city planning committee meeting when making pitch for the Victory garden and keeping the stone house in situ, as council members were ready to concede to Minto’s objections. Although Save Our Heritage Save the Stone House delegations point out that the location of the stone house is really not in the way of construction of Minto's model house row, and not anywhere near the middle of the development as the Report described, but easy to work around for some time while negotiating a viable adaptive reuse for the house in situ, committee members had already made up their minds and they pass a motion that is word for word the same as the Minto lawyer's letter submitted at the meeting. Oshawa Official Plan be approved and the necessary by-law be passed generally in accordance with the comments in the above-noted Report. Windfields Part" Plan be approved and the necessary by-law be passed generally in accordance with the comments in the above-noted Report. of the lands that are subject to the draft plan approval." "pay the City" and replacing it with "$311,000". 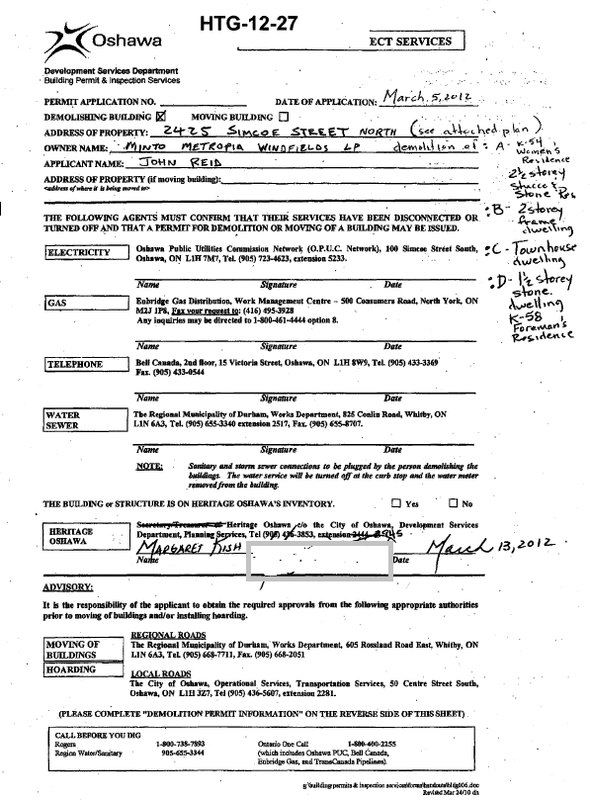 plan approval and prior to the expiry of the existing Demolition Permit No. efforts in support of the aforementioned obligation." submitted by Minto Metropia Windfields LP (File No. 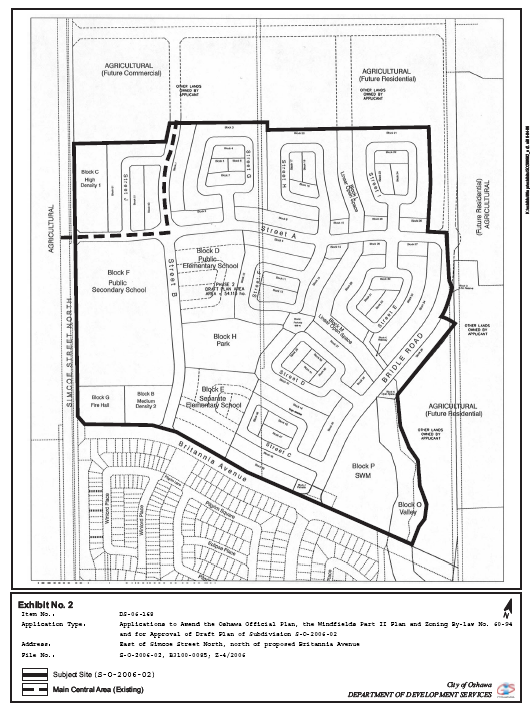 Z-2006-04) to amend Zoning Bylaw No. 60-94 to appropriate zones to implement a revised draft plan of subdivision and the proposed revised amendments to the Windfields Part" Plan be approved and the necessary by-law be passed generally in accordance with the comments in the above-noted Report. 5. That in accordance with Section 34(17) of the Planning Act and notwithstanding that the rezoning proposed in the public meeting report and at the public meeting differs to some degree from that approved by City Council, such differences are not substantial enough to require further notice and another public meeting. July 10, 2012 CHEX TV coverage "Heritage or Bust"
Four Oshawa Council members are not in attendance at this special summer council meeting to fast track the rezoning and draft plan approvals for hundreds of acres of north Oshawa...and there is no discussion among the elected. Developer plans are approved. If it had not been for the one delegation appearing in objection, the meeting would have been over in less than 5 minutes. 2) for a Green Hub and Cultural Gardens, with a submission from the non profit organization Foundation for Building Sustainable Communities (FBSC) outlining the proposal to acquire the stone house in situ on a lot size and at a price to be agreed upon, together with a Letter of Intent to begin serious deliberations. Aug 7, 2012 at Minto's Toronto offices, Steering Committee members meet, in person and by conference call, with Minto executives Tom Giancos and Vince Santino. 1) when Minto will have a decision on the FBSC proposal. Tom Giancos confirmed Minto is seriously reveiwing the FBSC plan. Once circulation among the various departments and consultation with Ottawa is complete they will meet again with FBSC, and include the Save Our Heritage, Save the Stone House Steering Committee in a meeting targeted for the first week of September. 2) Tom Giancos makes Steering Committee members aware the stone house site is not be in Phase I of their project. Aug 11, 2012 Michael Penney, owner of downtown Whitby's fabulous interior design boutique, publishes a post about the McLaughlin/Windfields stone house on his blog at www.michaelpenneystyle.com and invites his followers to email him at localheritagematters@gmail.com with messages of support to present to the developer Minto "and show that is is not okay to simply bulldoze our collective history"! Inspection reveals interesting design details of the stone features over all basement windows. The distinctive white face and black ears of the Shropshires sheep that were part George McLaughlin's Elmcroft Farm are paid tribute in the window keystones. Minto does not follow up as promised. FBSC emails and phone calls are not returned. 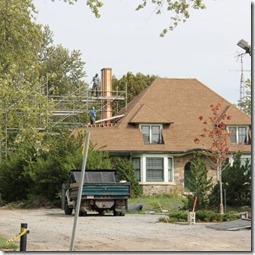 Sept 24, 2012 Scaffolding erected around the stone house raises questions. As chimney is being strapped Steering Committee learns that a 'species at risk bird' habitat in chimney can not be disturbed and that Minto has planned house demolition for Wed. Aug 26th. 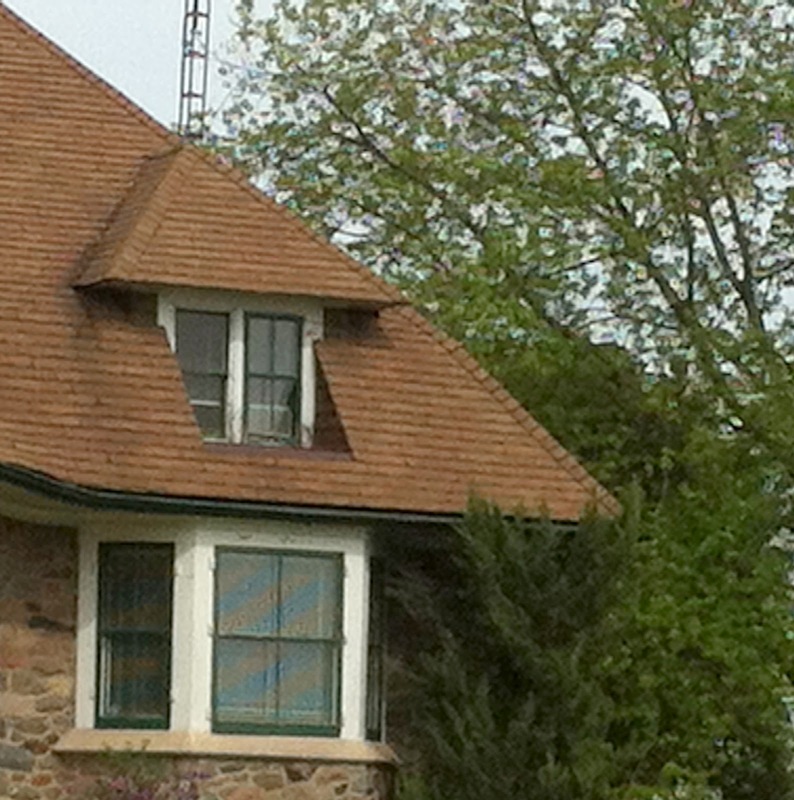 Concerns raised how the house can be demolished and chimney not compromised. Sept 25, 2012 after repeated phone calls to Minto Ottawa, Minto Toronto phones FBSC to say Agreement of Purchae and Sale rejected. Sept 26, 2012 Offer for house to be moved to nearby country estate property forwarded to Minto. 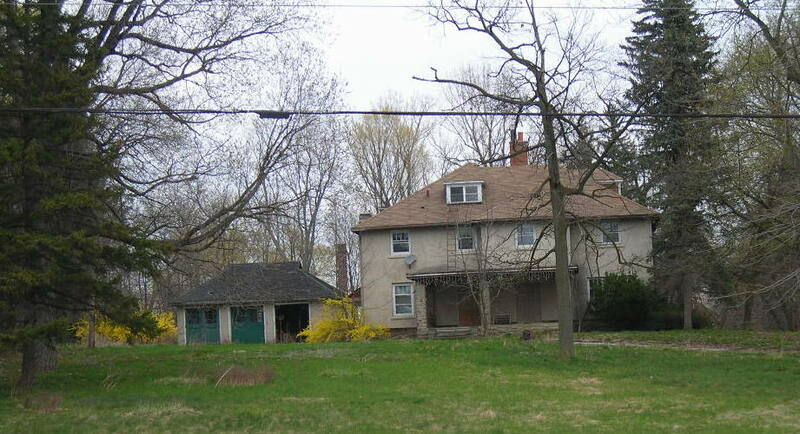 Minto rejects Offer, but house is not demolished.